Continuing the ongoing series of interviews on fantasy user interfaces, it’s my pleasure to welcome Bruno William. In this interview he talks about self-initiated work, VR interfaces, invisibility of good design and screen graphics in film and episodic television. In between and around, Bruno dives deeper into his work on the recently released first season of “Lost in Space”. Screen graphics for “Lost in Space”, courtesy of Bruno William. 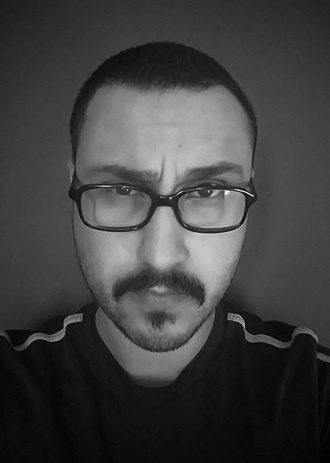 Bruno: I’m a designer based in São Paulo, Brazil. I always loved video games, music and movies, as well as martial arts. Art and design were always present in my life, directly or indirectly. 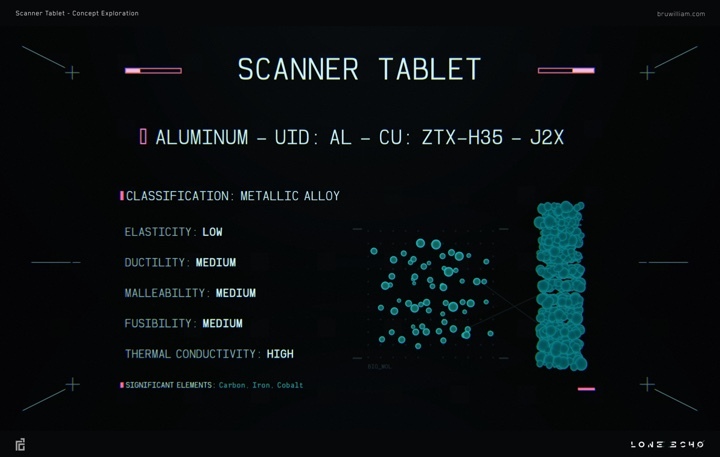 Since I was a kid, UI or fictional technology was always being there in movies like “The Matrix”, “Terminator” or “Alien”, even if at that time I hadn’t realized it yet. The Internet was my main source for study when I started out. You study and talk to other artists and designers, and absorb the knowledge. For me, that process still goes on today, and I’m still passionate about UI design, technology and storytelling. I was studying a lot of things like CGI, 3D character design, motion design – all by myself, even when it was frustrating. I knew that I wanted to work in the entertainment industry, doing art or design for film and video games. 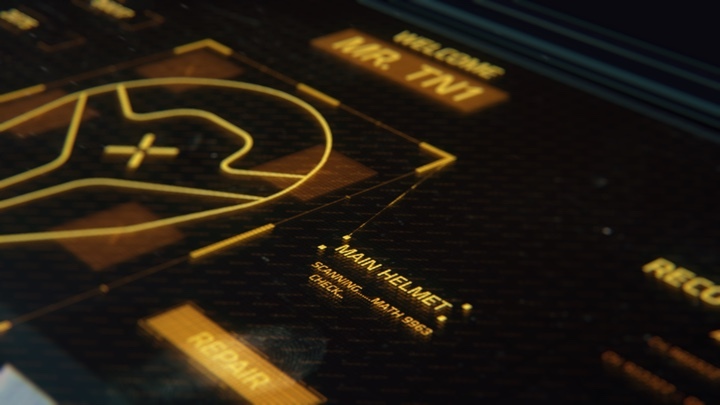 As I was trying to find myself or do something that I loved, I found the UI work that Ash Thorp was doing for film. That was a pivotal moment for me, to see all that knowledge and the way he approached it. It gave me a bit of confidence to pursue what I love. Those were my early inspirations, artists like Ash, Nicolas Lopardo, Alan Torres and Jayse Hansen, whose work I was studying at that time. Self-initiated work by Bruno William. Kirill: I saw a number of self-initiated projects in your portfolio. How do you approach starting a project without any specific requirements about it? Bruno: I always struggle with personal projects, and I think that’s expected when you’re starting out as an artist. When you work for a client, you have some kind of direction or a “problem” to be solved. When I do a personal project, my goal is to study and understand what I have to improve. I usually try to create a quick story behind the project. That way I can have a topic or two that can help me with my creative process. It’s common to say that you need to do a personal project, but you’re not sure what you want to do or what you can do. The best thing for me with my personal projects is to create the problem in my head, and then work to solve it. 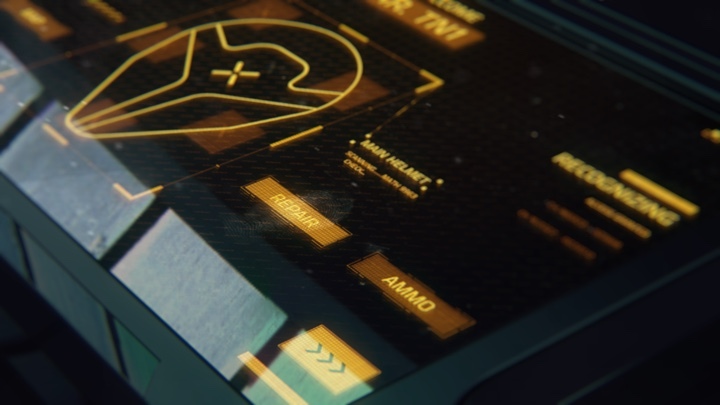 Screen graphics for “Lone Echo”, courtesy of Bruno William. Kirill: What can you tell about the project you did on designing a game interface in VR? Bruno: That was “Lone Echo” and it was a huge challenge. It was my first AAA-game, and it was my first time working in the field of VR in general. You usually create 2D, flat screens for devices that the user can touch or interact with physically. With VR, the question becomes how do you organize that information in a 3D space around the player. The most challenging thing on this project for me was to figure out how to make the information clear and functional to the player in 3D space. How do the elements interact with each other, as well as with the player, in an intuitive way? When it comes to design, it needs to be rooted in basic principles. We need to keep things simple as much as possible. Everything needs to be easy and readable. If we use tiny details or thin lines in VR, it can be annoying for the players. Reading and understanding a small text element in the 3D space can be a frustrating experience from the readability perspective. On “Lone Echo” everything needed to be bold and readable. It had to be structured and organized, avoiding tiny details. Kirill: There’s a lot of exploration happening in the VR space in the last few years. Without asking you to predict the future, what are your personal thoughts on that area? Bruno: You watch old sci-fi films and you see that cell phones were treated as super hi-tech, and now everybody has smartphones. I believe that the realms of VR and AR are the future that is almost here. This Skype conversation that we are having right now might be a hologram in 20 years, or something like that. Kirill: Between the ideas in your head, and the software tools at your disposal to bring those ideas to life, is one more important than the other for you? Bruno: It’s a balance between the two. For sure, the idea is essential and core. But you also need the tools to translate what you have in mind. It can be any tool really, even something as simple as pencil and paper. The one completes the other, in my opinion. Ideas are important, but if you don’t know the tools, it’s pretty hard to translate our ideas and convey those concepts of whatever it may be, a screen, a message or anything else. It’s all about the balance. Kirill: If you look at the tools at your disposal today, is anything achievable given enough time and money? Bruno: I believe that by combining the fundamentals and technique we can achieve anything. We have a lot of tools, and I try to learn a specific tool when I need it. When I find myself trying to achieve something and I don’t know the best approach, I try to understand what it is that I want to do, and then study the relevant tools that can help me translate what I have in mind. It’s the same with digital tools as with physical tools – pencil, paint, paper etc. Kirill: Is it hard to keep up with the latest versions of all the design tools at your disposal? Bruno: It’s not a huge problem for me. For example, when I’m working on user interface, I know exactly the tools I have to use. Those tools are pretty simple, actually. You might be using Illustrator, Photoshop, After Effects or Cinema 4D, and they get updated, but the tools remain very similar. I try to keep it as simple as possible. You do one version, and then you need to tweak and adjust it, and you end up iterating on it for another five versions. That’s why I want to keep my workflow simple. I try to find a smarter way to do my work and to help me with my process. I want to produce as much as possible without wasting too much time on tools and workflows. Kirill: Moving on to talk about your work on “Lost in Space”, how did it start for you? Bruno: I was working hard on my portfolio, and I saw the interview you did with Seth Molson. I got in touch with him to talk about career and work, and showed him some of my personal projects that I was doing. A little bit later he asked me if I’d be interested in helping out on a new project that he was starting to work on, and that turned out to be the new “Lost in Space”. I’m thankful for the opportunity to work with him on this project, not only because it’s a classic story, but also because it presented new challenges and opportunities. When I went into the production, it already had an approved design and style that Seth had created for a few screens. 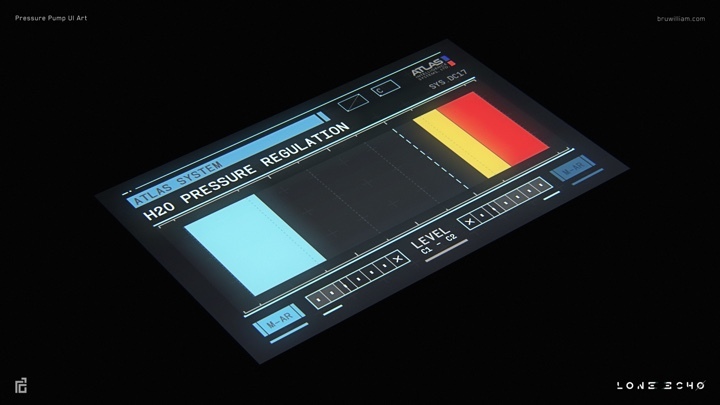 My responsibility on “Lost in Space” was to make additional screen graphics / FUI for the Jupiter 2 – the main spaceship for the Robinson family. The look and feel of those screens needed to be bold and believable, close to real-life screens that you can see in NASA. Kirill: As this was your first large-scale production doing screen graphics, was there anything particularly surprising when you started working on it? Bruno: If you’re just starting in the field, keep in mind that everything you do is not necessarily going be the final version. On this production, the work we did changed multiple times later on in the pipeline. The best approach I found was to produce the most amount of work in that short period of time that we had. That goes back to what I said earlier about working smarter. When you’re working on a big production, like a TV show or a video game, you do the initial version and then they want to see a different take on it. It can be a different layout, different colors, or a differently shaped device. Things move fast and you have to adapt. Kirill: I loved the color palette on Jupiter 2 screens in “Lost in Space”. Usually yellows and oranges are reserved to indicate warnings and errors, and in these screens they were used to convey the general, default system state. Bruno: When I joined the production, the first version was the classic blue [laughs]. The production wanted to see warmer colors, and I believe that oranges worked pretty well when you see the whole set as the family is trying to figure things out and solve whatever problems they are facing. Like you said, it’s different from what you usually see, and it makes it pop up a little bit. Kirill: I also liked how the graphics were integrated into the physical environment of the spaceship, with all the little physical knobs, dials and switches around the graphical elements. Bruno: On this project Seth was working directly with the production in Canada, and I was working from São Paulo. As I was sending those screens to Seth, we were going back and forth with the production people. There was a lot of feedback to make those screens work better for the story. Depending on the production you are working on, the time is too short and you will not always get a super detailed feedback, so we need to work smarter to solve problems, optimize our time in order to produce the amount of work we need to do. Kirill: There’s a lot of chunky fonts, thick lines and charts that don’t feel overloaded with information. Was that intentional? Bruno: When I say that we used a lot of NASA references, it was more about bringing the feeling of the real control room. That’s the beauty of fictional or fantasy UI. We can take something from the real world, use it as a reference and extrapolate into a completely different realm like “Lost in Space”. The coolest thing for me was to take those references to a different level in your realm. It was intentional that we didn’t want to use thin lines or a lot of detail. When you have a hero shot and the camera is focusing on the screen, it is for the audience to understand what is happening. We used bold shapes and presentation to put those hero shots in the context. We wanted to avoid tiny details and focus on the main information. That’s why we had bold shapes and big elements in the center of the screen. Kirill: How did it feel to see your work when the show came out? Bruno: It was my first experience on a production like that. The most rewarding thing for me was helping to tell that classic story, even if some of the screens didn’t make the final cut. I was doing a lot of layouts, Seth was tidying it up and making completely new screens out of it, and vice versa. It was back-and-forth, and it was really great to work with him. When I work on a production like this, I feel that I am collaborating on something bigger. That is the most rewarding thing for me. When I work on a technology project or a video game, I feel that it’s a collaboration that helps telling a story or shaping the future, not in a glamorous way. It was the same way on “Lost in Space”. It’s an old-school, classic story, and it was quite rewarding to work on it. If people didn’t notice a screen I worked on, it’s because I did a good job. The most important thing for me is the story and what’s happening in the scene. Kirill: Do you think it applies to design in general? Should good design be invisible? Bruno: It’s all about the balance of everything. In this particular case, screen design should be aligned with other elements of the production. It’s all about serving the story and supporting the narrative. It’s cool if the UI or any other production aspect is invisible, because the most important thing that the audience has to be paying attention to is the story. The “invisibility” is all about the harmony in this case. Kirill: Is it hard for you to convey what you do when people ask you what you do for a living? Bruno: It was hard in the very beginning. It is a bit easier these days, because we have a lot of devices. When I talk about what I do, I talk about interfaces. I explain that in terms of buttons, images and information that you see on your smartphone. It’s a bit easier with video games, as people are constantly clicking on icons, checking information and interacting with the game. I say that I am a designer, and that I do information presentation on screens. I ask if they saw Nick Fury’s monitors, and if they say that did, I say that I work on such monitors. It’s hard to explain in detail to people who are not in the industry. I prefer showing some of my work when I get asked this question. Kirill: Now that you have seen how things work from the inside, do you want to continue in this industry? Bruno: Absolutely. I’m just starting. There are beautiful possibilities for people who want to work with UI, or technology in general. I had the privilege to work on video games. I had the privilege to work with fine people from Perception on some future technology projects. I had the opportunity to work on TV shows. I worked with Seth on background screens for “Snowpiercer” that should be out next year. It’s the best time for people who want to work with UI. It’s not because it’s popular, but rather it’s about all the possibilities. You can be a UI artist on a video game. You can work on commercials. You can work on TV shows. You can work on films. I love sci-fi. I love technology. I love art. It’s so awesome for people who like similar things. I love other aspects of production as well, but right now I am focusing on UI. There are some opportunities that I can’t talk about yet, and I’m looking for future opportunities as well. Kirill: If you look back, would you have done anything differently? Bruno: It was pretty hard in the beginning. It can be a challenge to pursue what lies close to your heart. There’s a lot of time and passion that you need to put into it. People around you might not understand what is this thing that you want to do. Back in the day I watched “Fight Club”, and it had a big impact on me. In some way, it inspired me to pursue what was close to my heart. I wanted to focus on my future and my career. I wanted to find people that were working in this field, to contact them and talk with them about work. It wasn’t easy at all. There was a lot of pressure from people close to me. It’s always a challenge when you try to find yourself. I was talking with Jayse Hansen recently about personal projects. For people who are beginners or who are trying to find themselves, personal projects are their main weapon, so to speak. That might be your only opportunity in this case. Create a problem in your head, find your voice and stay focused on the design and creativity. Think about the future in a creative way, and never ever give up. Kirill: What’s your opinion on finding the balance between having and not having screens in your life? Bruno: It’s always hard. We have all the information we want in the palm of our hand. You go to a search engine, you type something and it’s right there. The amount of information available, and how easy it is to access is a positive. But there is an evil side to it that can be annoying. It can be a challenge to interact with the other human beings. There are always two sides to the coin. It is a huge positive when it comes to work. The amount of information that is right in front of us is incredible. I am in Brazil and you are in the US, and we are talking over video channel. That’s a big positive that didn’t exist before the Internet. The most common thing you see every day is people that are looking at their screens all the time. That is not necessarily a good experience. Kirill: It was so different when I was growing up. If you wanted to research something, you had to go to the library and hope that the librarian would point you to the right shelf. Now there is so much information available, and you need to develop a new skill that lets you quickly discard fluff and find something that is worth your time. I’m looking at my kids, and I’m thinking how different their adult world is going to be. Bruno: I completely agree. There is also another aspect of it when it comes to work. There is a lot of information on the Internet, and when everybody has access to the same information, it’s easy to repeat ourselves. You end up with things that look very similar. This is another challenge. And here I’d like to thank Bruno William for taking the time out of his busy schedule to talk with me about the art and craft of screen graphics. You can find more of his work on his Twitter, Behance and Instagram profiles. And if you’re interested to read additional interviews about the wonderful world of screen graphics and user interfaces for film and TV, click here for more.